Artists including Arctic Monkeys, Iron Maiden, Ed Sheeran, Noel Gallagher and Little Mix have launched a new campaign against ticket touts. Dubbed the FanFair Alliance, it is calling on the government to take tougher action against websites which resell concert tickets. 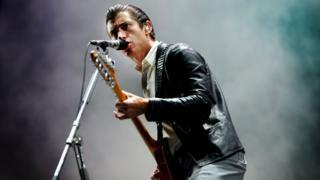 Launching the campaign, Arctic Monkeys' manager Ian McAndrew accused the sites of "rampant profiteering". He said the goal was to "make it easier for fans to buy tickets" at face value. "Fans' anger, their discontent, is what prompted me to do something about this," he told the BBC. "I hope the efforts of this campaign will put pressure on the government to do something." Fans are being urged to register their support for the initiative; while a petition set up by the same group of artists and managers in May has already attracted 44,000 signatures. The secondary ticketing market in the UK is thought to be worth more than £1bn a year. But the music industry is concerned that fans are being excluded from concerts by "professional" resellers, who scoop up tickets as soon as they go on sale, then advertise them at vastly inflated prices. Earlier this year, tickets to see Radiohead and Adele were listed at more than 100 times their face value this year; while tickets to see Justin Bieber's Purpose tour in November are currently being advertised at £1,200, against a face value of £74.50. McAndrew said this practice was "the number one grievance" he heard from fans. "Parents write letters and fans write letters because they feel they've been ripped off," said Harry Magee, who manages One Direction and Little Mix. "When it falls at the artist's door, you have to do something about it because it damages their career," he told BBC News. However, the four main secondary ticketing websites - Seatwave, Viagogo, Stubhub and Getmein - say these high prices are rarely achieved. Stubhub has previously pointed out that 10% of their stock is sold for less than face value; and Viagogo told the BBC that "while a seller can list a ticket at any price he likes, it doesn't mean the ticket will actually sell at that price". The sites also say that the majority of their sellers are fans, not touts. Image caption Little Mix, who staged the UK's biggest arena tour of 2016, are worried fans will be "ripped off"
But the FanFair Alliance claims the "black market" in ticket resale has "reached an industrial-scale" with touts "operating anonymously and with impunity on under-regulated secondary ticketing sites". They are urging the government to enforce existing legislation, which would force secondary ticketing sites to reveal the identity of their sellers. A government-commissioned review of the market, published in May, said the sites "are seemingly falling short" when it comes to ensuring compliance with the legislation. The review panel, chaired by Professor Michael Waterson, recommended that a body ,such as Trading Standards, "should carry out a concerted investigation of compliance, followed by action coordinated with the police". The FanFair Alliance calls for such an investigation to begin promptly; and also asks the government to outlaw the use of "bots" - automated computer programs which "harvest" tickets when they go on sale - "and attach appropriate penalties" for people who employ them. According to the group, such technologies marred Black Sabbath's recent seven-date tour of the UK. It says that 11,695 tickets were listed for resale "within minutes" of the tour going on sale. The FanFair campaign is supported by the Musicians' Union, the Association of Independent Festivals, the Association of Independent Music and the British Academy of Songwriters, Composers & Authors, amongst others.